This photograph shows Cuban influence in Miami, specifically here on SW 8th St., part of Little Havana. The nickname comes from the large Cuban population concentrated in the area from the 1970s through the 1990s. The influx of Cubans in the area, which began in the 1960s, was due to a a large number of Cuban refugee’s fleeing the country. In recent years the demographic have shifted toward a Central and South American majority. 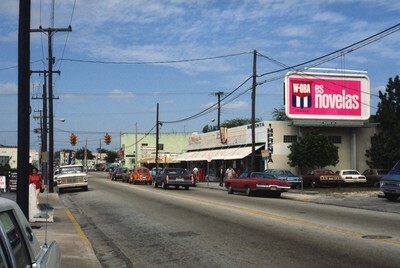 Smolski, Chet, "Miami: Little Havana, SW 8th Street" (1978). Smolski Images. 452.